The gastight rectangular shut-off damper GD-R will be used in ventilation systems for sensitive areas, like the chemical, the pharmaceutical, the nuclear industry or bio-safety laboratories, where high leak tightness requirements apply. The specially designed kinematical mechanism secures the damper blade at the end positions “open” and “close” by means of special toggle levers in case of a failure of energy support. Two concentric sealing rings fixed to the damper seat create high tightness as well as a test groove in the gap between the two sealing rings. In order to test the leak free seat of the damper blade the test groove can be connected to an appropriate seal test device via a fast acting coupling from outside the damper. To protect the sealing the damper blade starts the opening process with a linear movement. This movement is created by a special lever system, so first the damper runs parallel and after reaching a certain distance the movement turns automatically into a rotating motion. This mechanism avoids transverse loading force to the damper sealing. Double shaft transition sealing. Connections to test tightness of shaft transition during operation available on demand. Housing, damper blade and lever mechanism made of stainless steel. All media-touched parts are welded continuously and without gaps to ensure an easy decontamination. The housing, the damper seat and the shaft transition surpass by far the leak tightness requirements of DIN 25 496. Electrical, pneumatic and manual actuators available. The electrical actuator is also available as spring return (fail-safe) version. 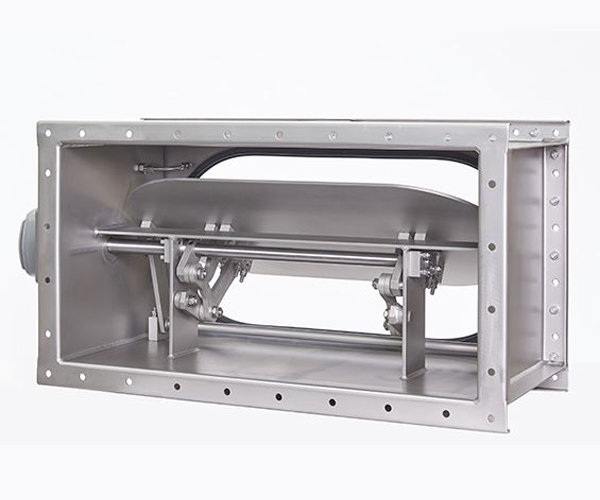 The gastight rectangular shut-off damper GD-R surpasses by far the leak tightness requirements specified in DIN 25 496 (Ventilating components in nuclear facilities). Krantz‘s gastight rectangular shut-off damper GD-R guarantees a maximum of safety and reliability thanks to its design, its system and the special damper mechanism.